Beefing up the Blue set we have newly crowned BIFF champion and general wad Gracie Martin. Next up the Greys are getting an eclectic makeover by our in-house setters. And last but not least sees the return of The Lab Test, a whole new set of competition Reds for you to crush into submission set by Joey Watts. Don’t forget to pick up your Lab Test sheets at the desk for £1 to go into our Summer Lab Test draw later in the year. 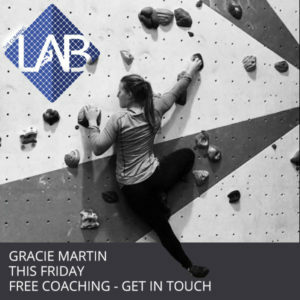 Get it while you can, this Friday means FREE COACHING from Gracie Martin. Yes that’s right, a free session with one of Britain’s finest female athletes. You must pre-book via Facebook by DMing Gracie herself and don’t forget the free pizza to boot. Ladies, don’t forget to come climb on Ladies Night every Monday at the bargain rate of £5 from 4pm. Tuesday means free coaching from the lovely Doug so grab him for a quick teach 6 – 9pm. We also have bookable coaching sessions 8-9pm every Tuesday £15 come to the Reception desk to bag your place. 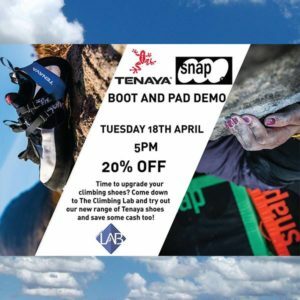 Students come and join us for £5 climbing every Wednesday all day with shoe hire included. Don’t forget the snacks are on us every Friday evening with a cheeky FREE slice or two of pizza. We’ll see you soon at The Climbing Lab.